Read up on how to vacuum the correct way. Proper vacuuming is the most important step to keeping your carpet clean and in good shape. You probably knew that vacuuming keeps your floors clean, but did you know it can also have the largest impact on the air you breathe? Your carpets trap dust and allergens and release them every time someone walks on your floor. Plus, by vacuuming up loose soil before it sinks deep into the carpet pile, you also help preserve the comfort of your carpet. Vacuuming your carpets has TONS of benefits, so it’s important to do it frequently and correctly. Don’t forget those corners! These tight areas and crevices are where dust tends to build the most. There are attachments that help you get hard to reach crevices, so be sure to use them. Remember to remove and replace or empty vacuum bags when they are half to two-thirds full. 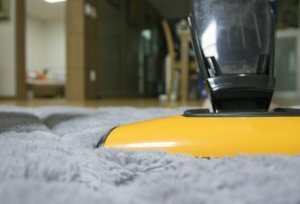 Don’t risk your vacuum getting too full and leaking all over the carpets you just cleaned. Keep hoses and attachments free from obstructions. Most vacuums that are discarded as nonfunctional often are only clogged somewhere in the unit. Learn where these likely places are from the manufacturer’s instructions and make sure to clean them out. Keep brushes clean (for example, remove tangled hair) and replace them when worn. Typically, worn brushes are stiff, and they cause surface texture change on the carpet. Empty containers or replace bags when half full to prevent spills. Using these tips, there is a lot of carpet care that you can do on your own. However, just vacuuming isn’t enough to keep your carpet healthy. You should call in a professional cleaner like Temecula Valley Chem-Dry about every 6-12 months for best results!